Groundwater is increasingly important for meeting water demand across the United States (U.S.). Forward thinking governance and effective management are necessary for its sustainable use. 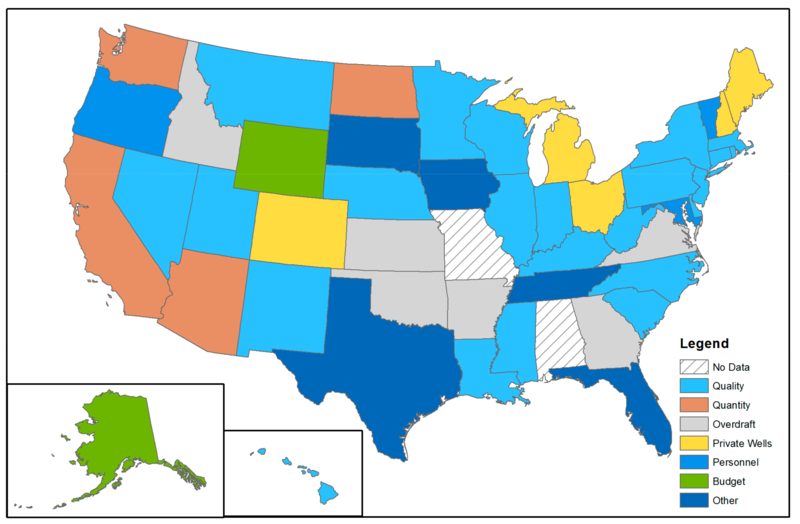 In the U.S., state governments are primarily responsible for groundwater governance (i.e., making laws, policies, and regulations) and management (i.e., implementation of laws, policies, and regulations). This decentralized system results in diverse strategies and practices. We surveyed a water quality professional from each state to better understand commonalities and differences across states. These professionals identify a wide assortment of groundwater issues and concerns, including quality and quantity impairment, staffing and budget issues, private well vulnerability, and overdraft. Respondents indicate contamination problems from natural and anthropogenic sources. Most respondents report that their states have significantly changed groundwater quality policy during the past 30 years. While most states have multiple funding sources for water quality programs, program budgets have decreased in the last decade, thereby hindering effective implementation of new policies. Over half of respondents indicate that water-quality/water-level monitoring and increased groundwater pumping will require more attention over the next decade. Several respondents anticipate groundwater regulation changes in the next five years. We discuss how our findings align with current groundwater uses in the U.S.